Government at all Levels Needs to Act on Contract Purchase Predators – Now! New Orleans Advocates and lawyers are firing more and more bullets at contract purchase predators and the Home Savers Campaign has raised the ante on its demands to Fannie Mae (FNMA) in yet more signs that the offensive against these real estate robber barons is gaining increased traction. Another front has opened with the filing of a lawsuit by Fair Housing Center of Central Indiana at the end of May. They went after local operator Empire Holding Company and its subsidiary Rainbow Realty, that has acquired over 1000 dilapidated houses in the Indianapolis area and is marketing them as contract purchase rent-to-own properties. The owner admits that virtually all of them are uninhabitable. The Fair Housing Center argues that they are breaking a pile of laws, but also makes the claim that a huge percentage of these houses are in African-American areas and that the contract sales push is directed at these same populations in a discriminatory manner. 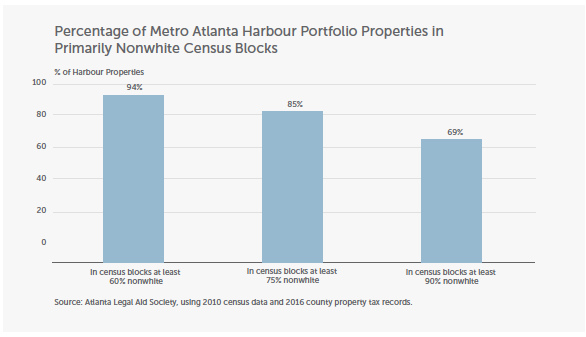 Atlanta Legal Aid attorneys conducted a search of property tax records in six metro Atlanta counties and found 94 properties currently held by Harbour Portfolio in the Atlanta area; most of these homes were likely being sold through land installment contracts as that is Harbour’s business model.9 Nearly all those properties (approximately 93 percent) were located in census blocks that are at least 60 percent nonwhite, and a significant majority were in census blocks that are at least 90 percent nonwhite. It’s hard to avoid underlining the obvious. First, the scale of this activity is huge, when you are talking about a local company in Indianapolis alone handling more than 1000 such houses. In an evil local market, they dominate any other national players. Secondly, these are not equal opportunity predators, but are de facto discriminators. For these reasons and others, the Home Savers Campaign is also increasing the pressure by sending a letter to the head of Fannie Mae today, asking that the agency investigate and bar not only Vision Property Management, as they did recently, but also Harbour Portfolio. In addition the campaign named a number of companies using the same practices in the Detroit market and demanded that they also be barred, indicating as well they they wanted a meeting with FNMA in order to push for clearer standards to block access to government auctions in the future to any company that plans to sell them “as is” through land installment contracts. Home Savers Campaign also indicated that it intends to make similar demands city to city in other markets for FNMA bans, as they understand the FNMA criteria better. It’s bad, and it’s on! This entry was posted in Citizen Wealth, Financial Justice, Foreclosure and tagged affordable housing, Contract for Deed, home savers campaign, land installment contracts, Rent to Own by Wade. Bookmark the permalink.